The following is based on an article I wrote for issue 237 of Furniture & Cabinet Making. Although there is a reassuring lack of ancient spike filled pits under my bench, and no nest of vipers guarding my tool chest, I have recently found myself drawing inspiration from my favourite childhood Indiana Jones movies and assuming the role of a workshop archaeologist (sadly this is where any comparison to Harrison Ford ends). Thanks to a family friend I recently came into possession of a large batch of tools being disposed of in a house clearance. I had no idea what was included in this collection, so when several large boxes where unloaded from the delivery van I was curious to discover what they contained. 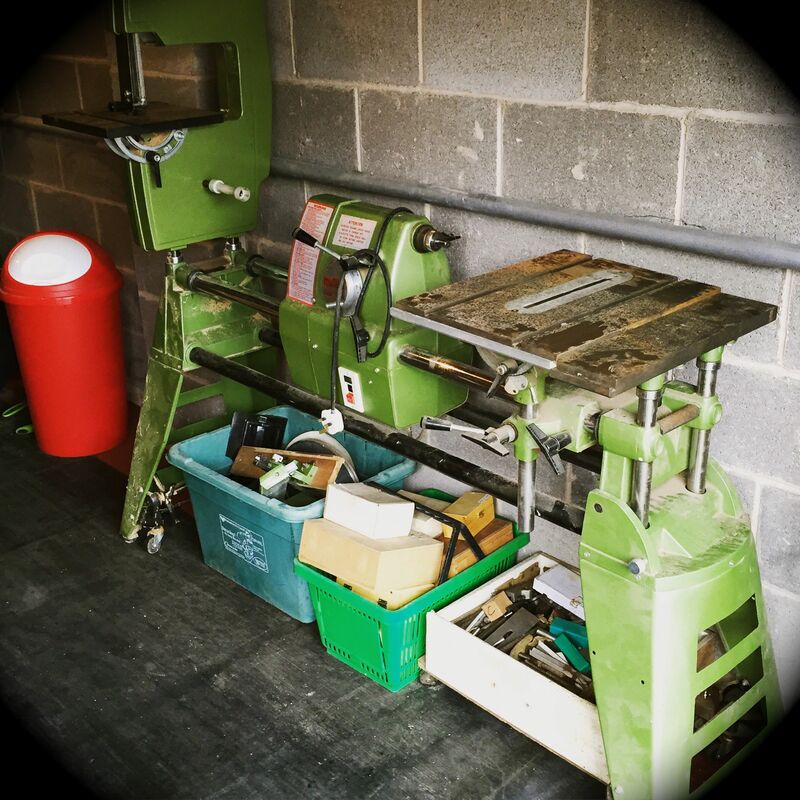 A pristine condition Shopsmith combination lathe/ band saw/ disc sander machine was the undoubted centrepiece, which means that I can finally build that pair of Roorkee chairs I’ve been promising myself. The rest of the collection was a jumbled assortment of smaller items in several battered hardwood boxes, and I have been slowly sifting through these crates and working out exactly what they contain. I didn’t know the former owner of these tools, nor do I know anything about him other than what his tools tell me. And so I have started a process of workshop archaeology; piecing together an impression of another craftsman from (what is probably just a selection of) his tools. And in doing so, the idea of heritage (about which I have written before) started to call its siren song. Because I began wondering what a future woodworker and workshop archaeologist would surmise from the contents of my tool chest. If all that is left to tell the story of my craft is my tools, what would they say? Thanks to two readers, I now know what this mystery tool is. I don’t think the contents of my tool chest would surprise anyone. It is very obviously focused on hand tool work, and save for a couple of specific lutherie tools, most of my tool collection looks like it was lifted from the pages of the Joiner & Cabinetmaker or any other traditional handwork text. 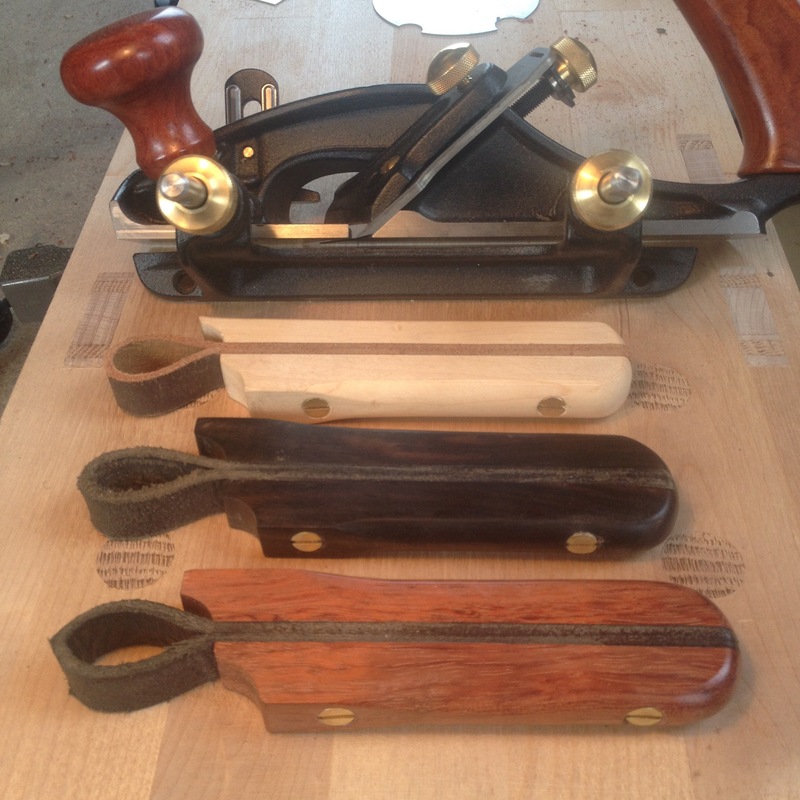 So you will find the standard issue hand planes, chisels, marking and measuring tools, and a nest of saws. 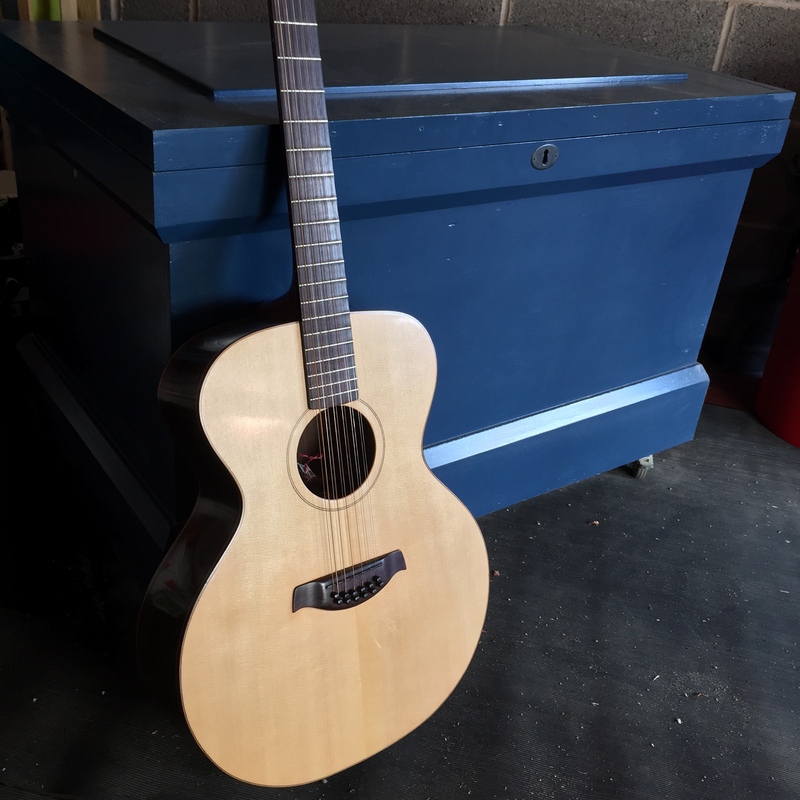 Only the bending iron, purfling cutter, and fret files might give any indication that I am predominantly a luthier rather than a cabinetmaker. A set of letter blocks, but what sort of printing machine do they fit? In contrast the collection I recently acquired makes for a varied, and fascinating subject. The vast collection of router bits, in addition to the Shopsmith machine, allows me to infer that the previous owner was a predominantly machine based woodworker. He was also, I think, a metal worker. There is an endless supply of round and square steel stock, milling bits, and numerous metal working tools including some wonderful knurling tools and parallel jawed pliers. But some of the crates hold more unexpected wonders. 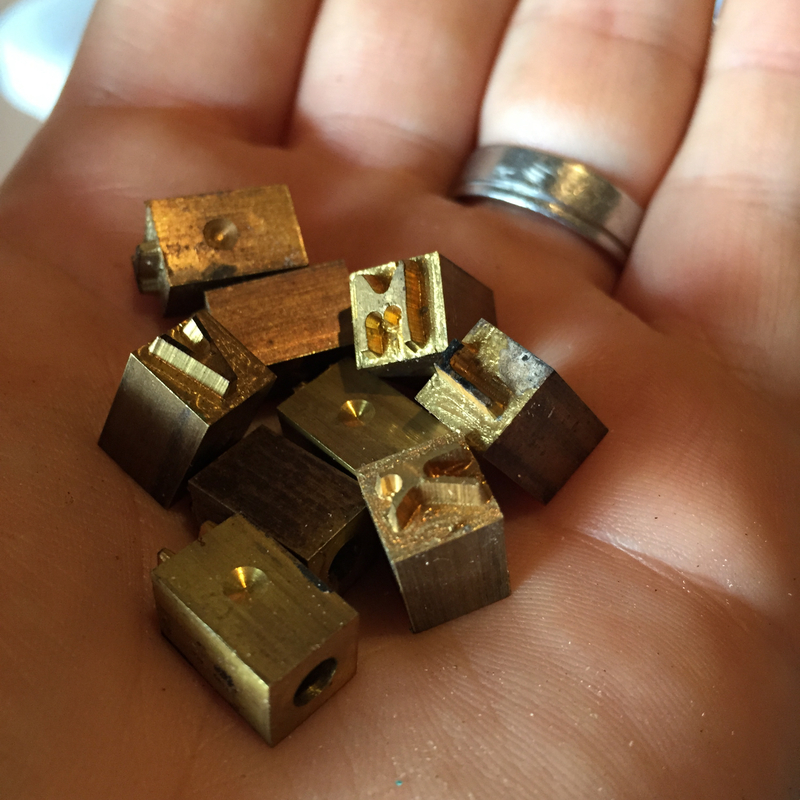 A bag of small brass letter blocks for use in a printing machine, a pyrography machine, and a 3” sweep brace, were some of the more unexpected finds buried in one of the crates. It is hard to picture this craftsman; was he accomplished in many crafts, or was he a spirited dabber? What as his work like? Whatever the reality, the sheer breadth of his interests leaves me wishing that I could have talked to him about his craft. This Anarchist’s Tool Chest houses all of my tools. 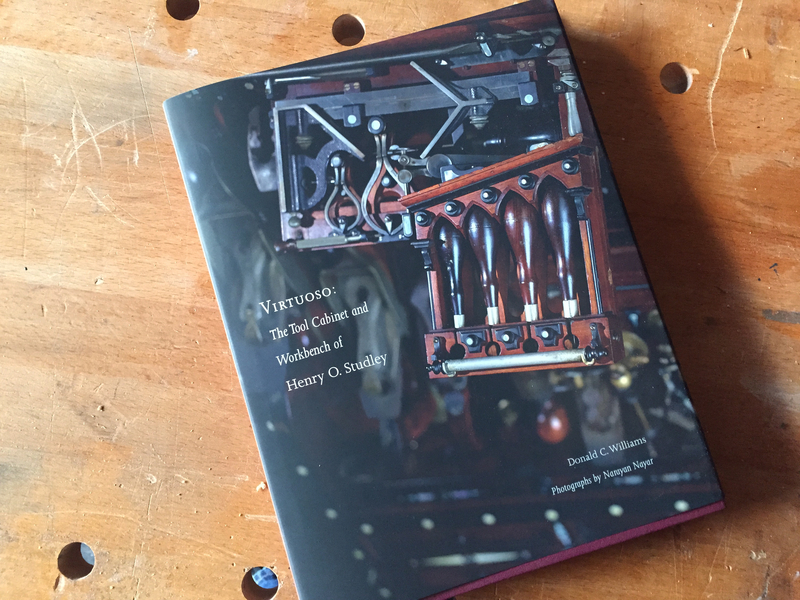 By sheer coincidence, my excursion into workshop archaeology came just after I had finished reading Virtuoso, the recent book on the tool cabinet of American piano builder H.O Studley (published by Lost Art Press, 2015). And my experiences of trying to piece together a picture of an unknown craftsman reminds me of the work that Don Williams undertook in researching Virtuoso (although my workshop archaeology is on a far less grand scale). Like my mysterious craftsman, we know little about Studley, but in Virtuoso Williams‘s forensic examination of Studley’s iconic tool cabinet, and the tools it contains, together with solid historic research builds a picture of the elusive craftsman who built and used the cabinet. It is a fascinating read, both for the intricacies of the tool cabinet, which in many ways resembles a 3D puzzle, and also for the light it sheds on a craftsman who has been obscured by the tool cabinet he clearly intended to be his legacy and the expression of his craft. As a book examining the very highest levels of craftsmanship, and workshop archaeology, Virtuoso comes highly recommended. Very few of us ever achieve the enormous level of skill that H.O Studley possessed. But most of us will create at least one piece of work which will outlive us. 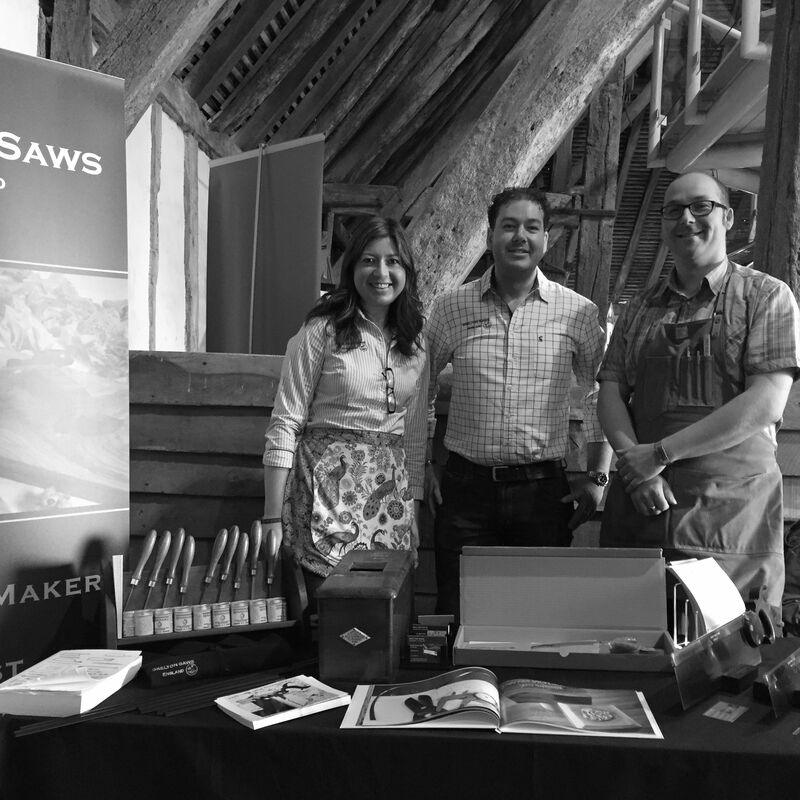 And like the owner of my recent acquisitions, we will leave behind a tool collection that others will pick through and make use of, continuing the heritage of woodwork. I find this very comforting; the idea that my tools will continue to be used to create long after I am gone. 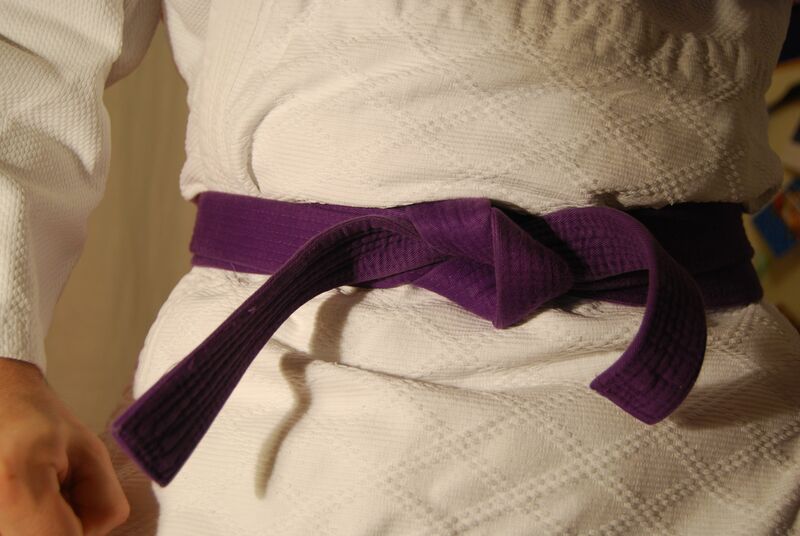 At my old martial arts club there was a tradition of never washing your belt, because the dirt it picked up represented years of hard won experience and training. I like to think that the patina and wear on each of my tools carries a similar message for the future owners to interpret and decode. So, the next time you lift the lid on your tool chest (or open the door to your workshop), consider what the contents would say about you and your craft to a future workshop archaeologist. 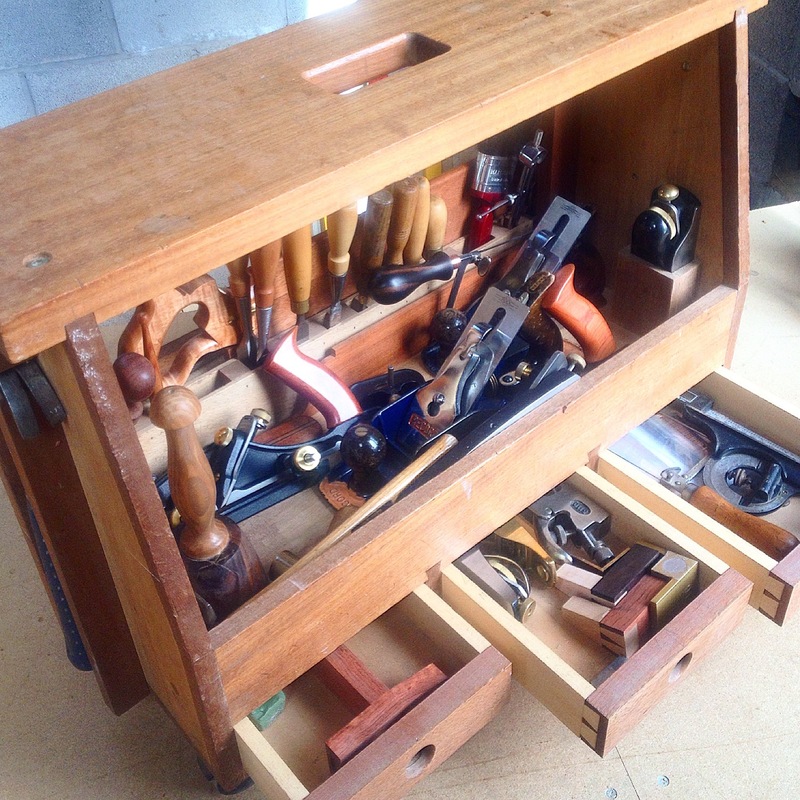 I have written previously about the personal significance of my tool chest (particularly in issue 224) but in short this is a traditional 18th century English design, recently re-popularised by Christopher Schwarz in his book The Anarchist’s Tool Chest (Lost Art Press, 2011). 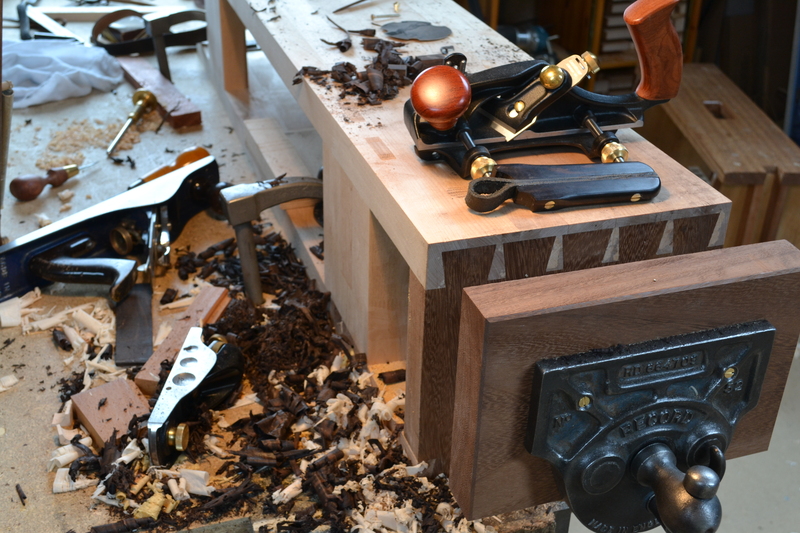 The chest serves several critical functions in my workshop. It protects my tools from dust and moisture (the two key ingredients of rust) and serves as an excellent vessel for both storing tools and working from. 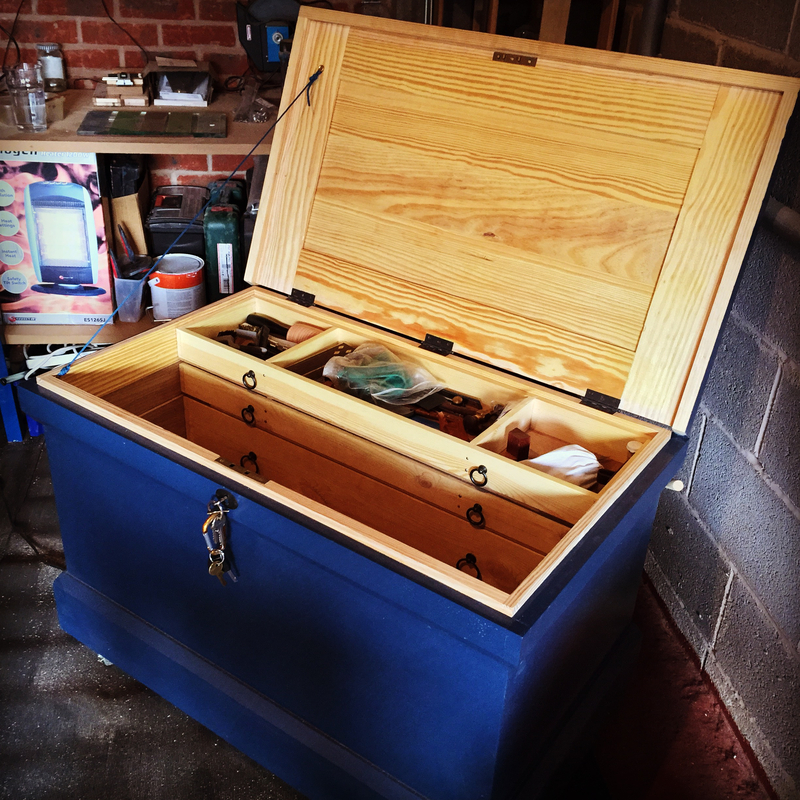 Because of the robust construction (a dovetailed carcase, and mortise and tenon lid, all in inch thick southern yellow pine), the tool chest will also serve as an ark for my tools, ensuring that my children, and their children, can continue to use my tools for many years to come. But most of all, my Anarchist’s Tool Chest is a constant reminder of how I want to approach my craft. It is a reminder of the countless craftsmen who came before me and used the same traditional tools, techniques (and yes, form of tool chest) as I do, and of those that will follow the same path long after I am gone. 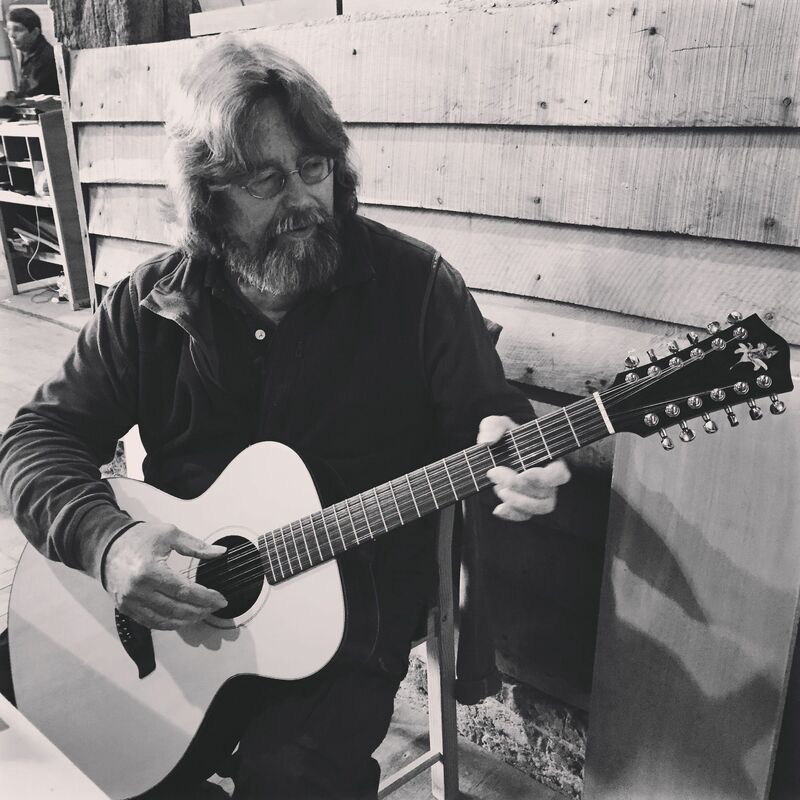 This guitar, and my tool chest, are all that is needed to tell the story of my craft. 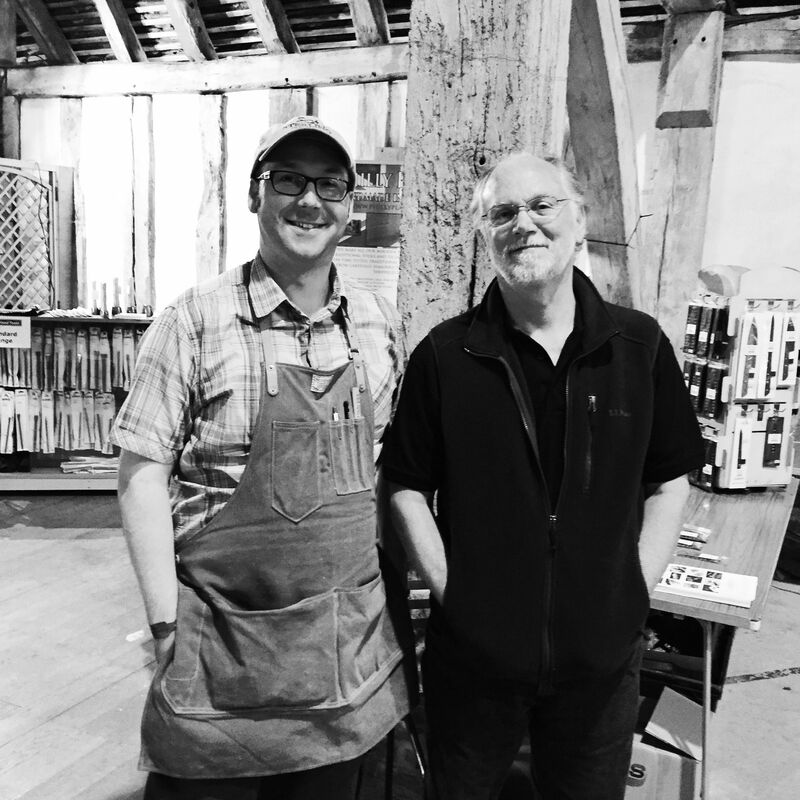 I’m kicking things in a slightly different direction today, and interviewing good buddy, tool maker, and community minded woodworker Bern Billsberry (maker of the invaluable, and now infamous, Nut Saver). 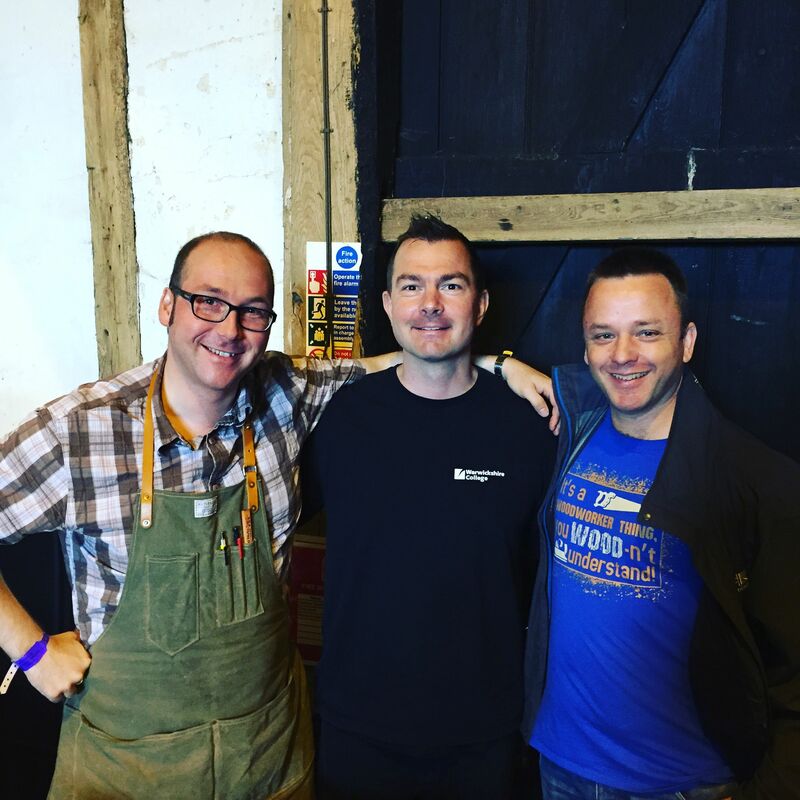 This will hopefully become a regular feature on the blog, so if readers think know of any other makers who have an interesting story to tell, or who deserve more exposure, please do let me know. But for now, let’s meet Bern. You’re a professional woodworker, right? Can you tell us about how you trained? I’ve been a self-employed carpenter and joirner for nearly 30 years having trained with my Dad who had a joinery & cabinet making shop. He carried out work for the National Trust, as well as work on listed buildings and restoration work for the antique trade, so I had a varied grounding which covered many aspects of the trade. 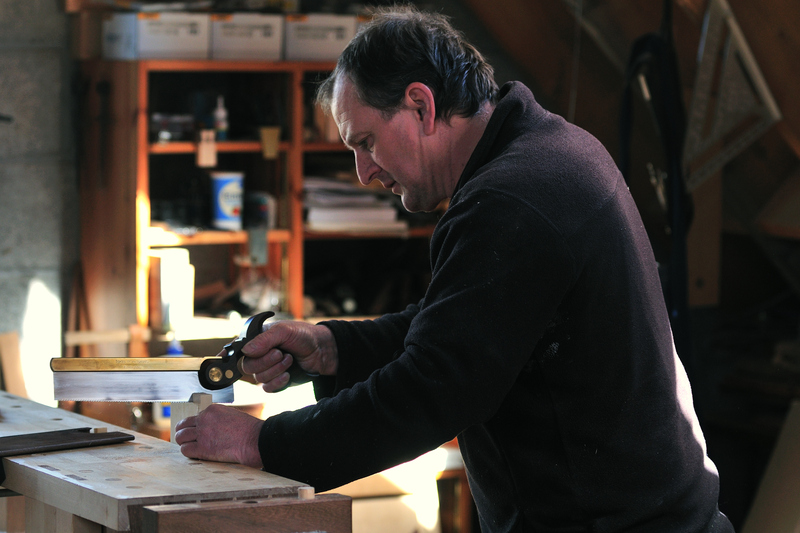 His joinery shop was full of big old cast iron machinery – Watkin, Wilson, Danckaert and Elu power tools. Once I had completed my training with my Dad I then ventured out on my own, I was in my early twenties. Following on from question 1, what does an average day in the workshop/ on site look like for you What sort of work do you commonly do? Work can vary quite a lot, I’ve spent most of my time working on domestic properties. General carpentry and joinery including cut roofs, dorma extensions, wndows, doors, staurs, kitchen fitting and also small building work – extensions and conservatories. Sometimes I would have the opportunity to make built-in furniture like alcove cabinets and wardrobes. 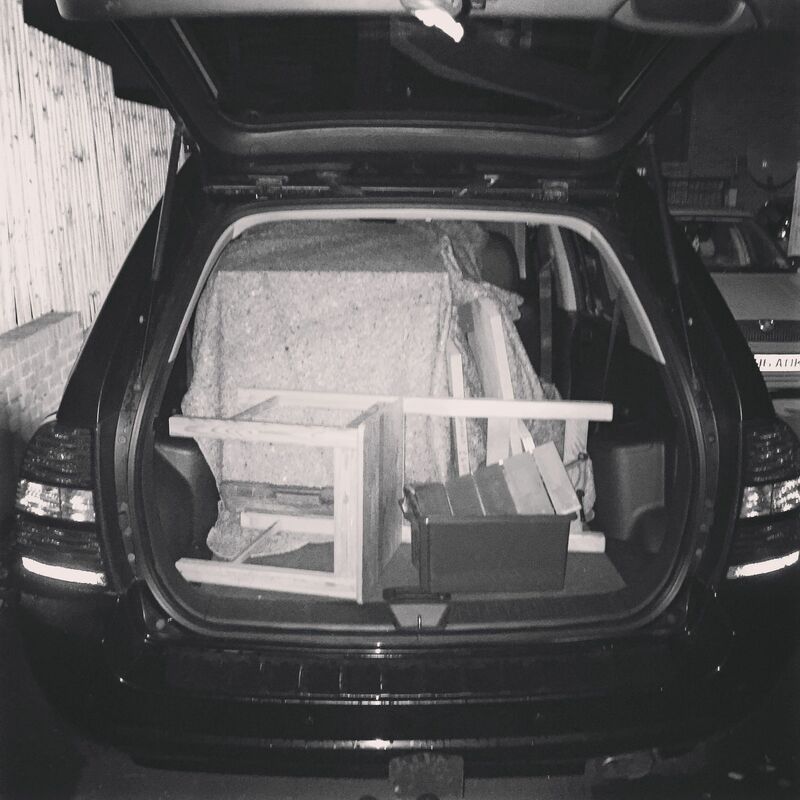 I would now like to focus on working more in my workshop and therefore trying to reduce my commitment to site work. Toolmaking, cabinet work and joinery is the path I would now like to go down, but finding it much harder to earn a living from it so I am still carrying out some site work at the moment to top up my wages. My working day in the workshop is a long one, I usually start around 8am and don’t finish until around 8pm. With site work I aim to arrive by 8:30am and more often than not will be home by 6pm. You are a man of many tool chests, including an Anarchist’s Tool Chest, and a David Barron chest. But the most fascinating chest is the travelling bench/ chest you were using on the first New English Workshop course. Tell us about this chest. 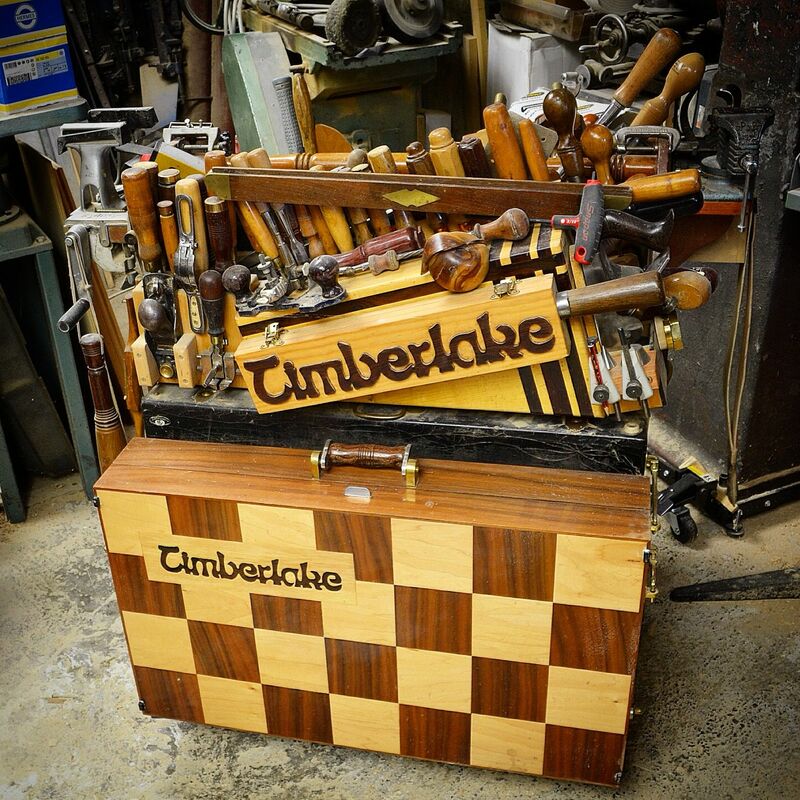 Like my Dad I have always been fascinated with tools and tool chests. The travelling bench/ chest came about when I worked as part of a two-man team for a small window installation company back in the 90s. The company van would be loaded up with all the tools we needed, but my work partner would always have to leave the job site for on reason or another, taking with him whatever tools were still left on the van. There was always something I needed and I would have to struggle o, so I came up with the tool bo that would hold all the essentials I would need to carry on with the job and it could also double-up as a bench, hop-up, saw horse and door buck. Jim Toplin’s Tool Box book was a big help and inspiration, and still is. Most people will know you as the maker of the Nut Saver. Where did the idea for the Nut Saver come from, and how did the design develop from the original concept? 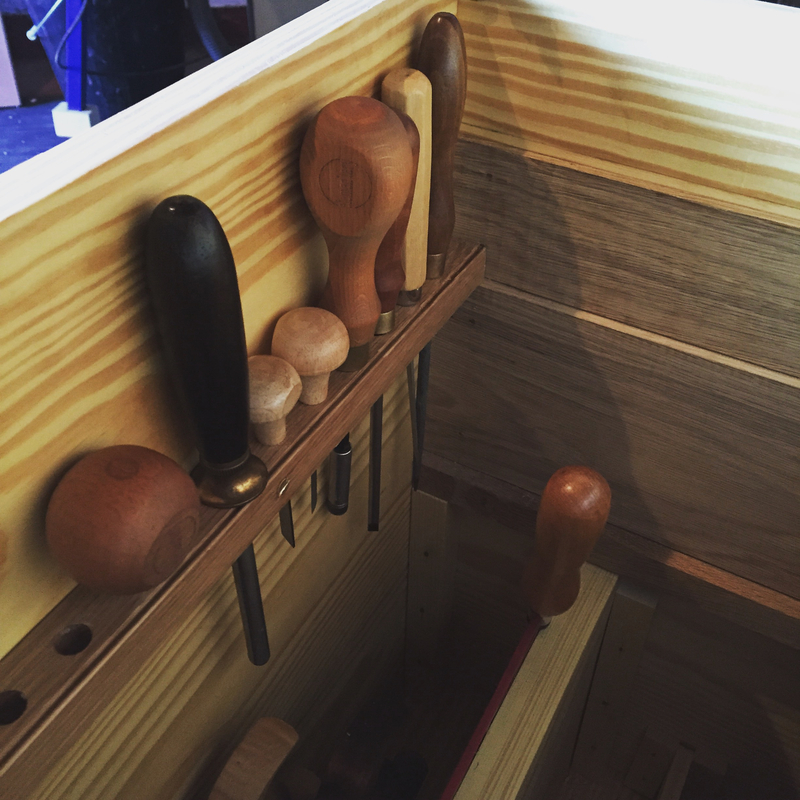 I attended one of the 2014 New English Workshop classes taken by Chris Schwarz, to make the Anarchist’s Tool Chest. We were advised to use pliers to tighten the brass collets on the Veritas skew rebate plane fence, as then tended to slip in use. My plane was brand new and I didn’t want to damage it with pliers, but there was no alternative. I wasn’t happy to keep causing this damage and was keen to come up with a solution to the problem. 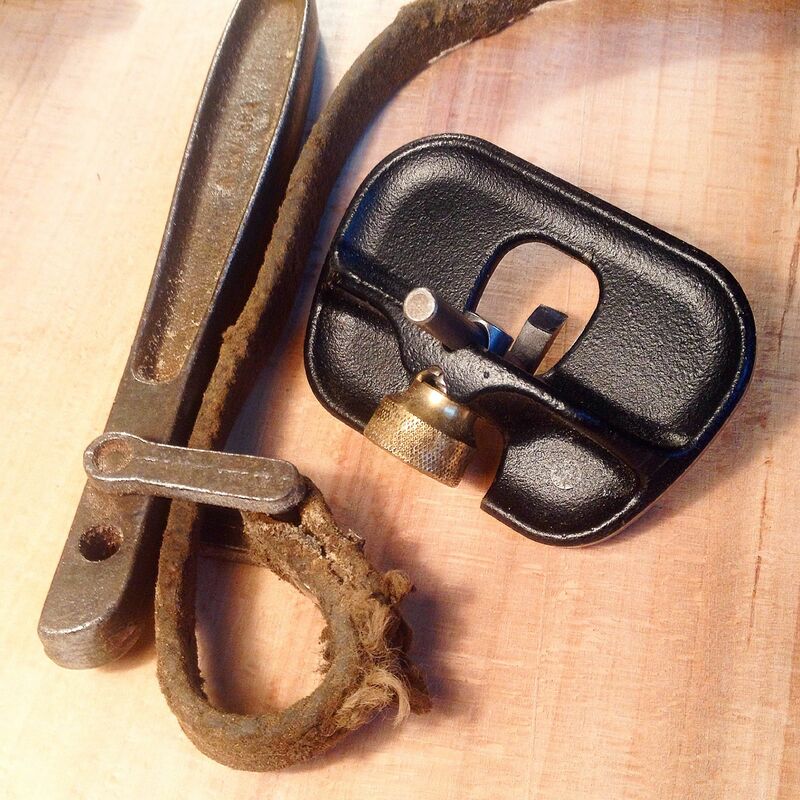 I remembered a tool that I had – a strap wrench back from around the time of the Second World War made of cast iron with steel reinforced braided webbing. After a little research on the web, I found it was an RAF tool for aircraft maintenance. This tool worked a little too well as you could quite easily over tighten and cause damage to the threads, so I needed to come up with something that would tighten with just the right amount of torque. I decided to try out leather in place of the webbing as I felt it had all the right properties and is a pleasing combination with timber. Leather is a great natural product that is easily worked, and readily available, with the right amount of flexibility and grip to be gentle on the brass. Having a love of wood it was an easy decision to replace the metal parts with timber and I also wanted it to be something that fellow woodworkers could make for themselves. With this in mind I kept the tool uncomplicated and it took only three prototypes to perfect the design with just small tweaks between each one. The Instagram community has obviously only been around for a short part of your career, but you’ve really become a mainstay of the online community. 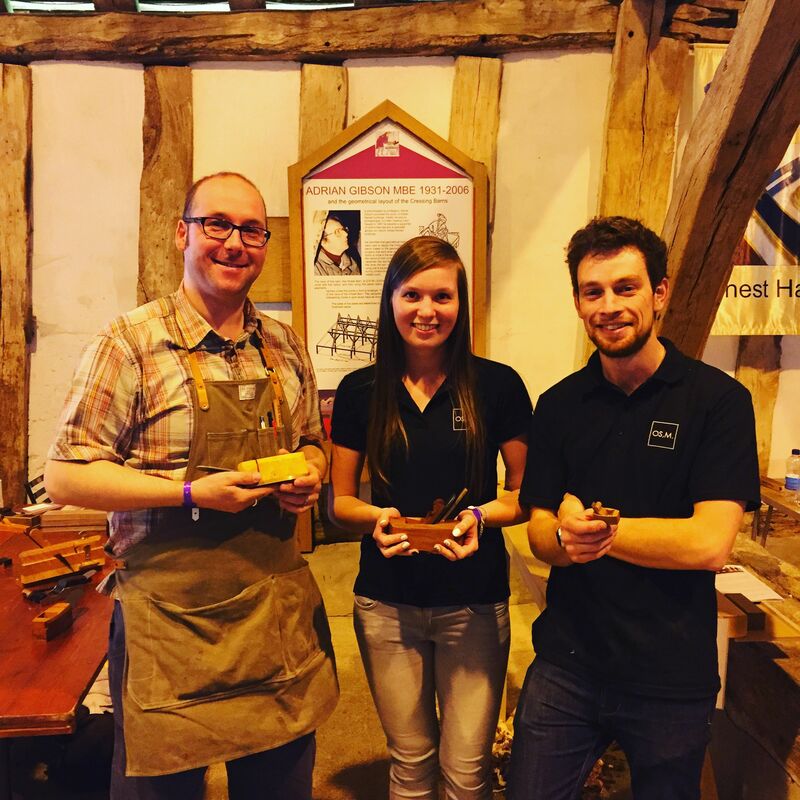 Can you tell us about how community between craftsmen has changed (or evolved) over the course of your career? 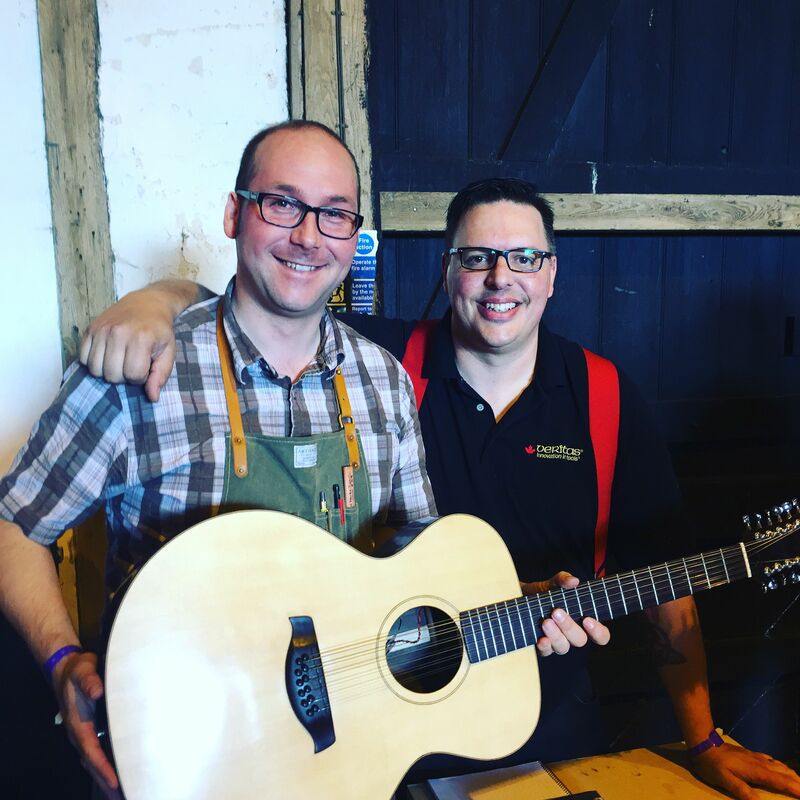 You never stop learning in this career and now with social networking it is a lot easier to gain information from really gifted craftsmen and women that love their work and are willing to share their knowledge. 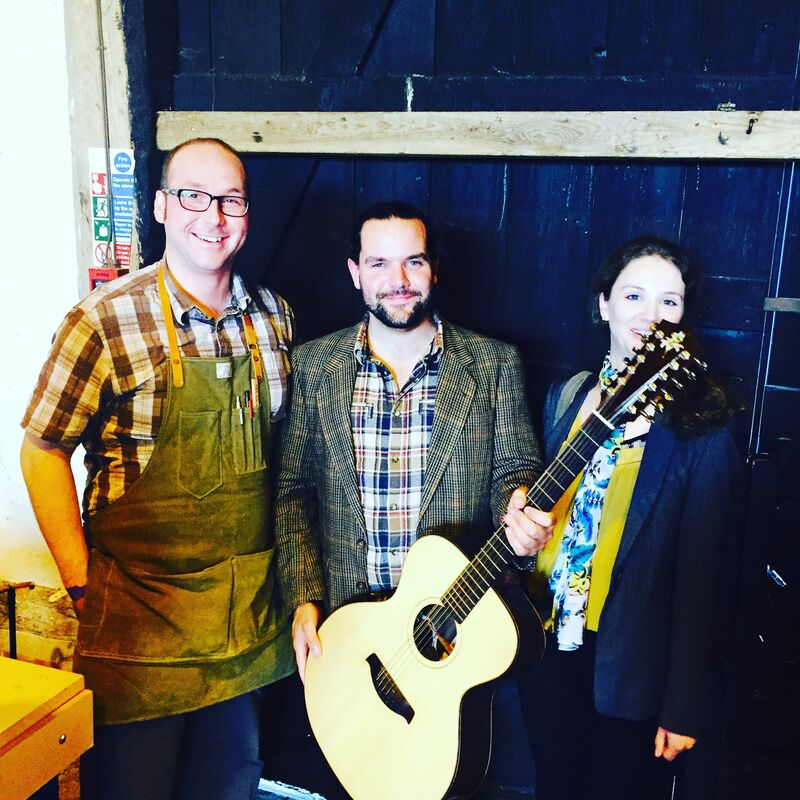 In the past it was rare for craftsmen to invite you into their workshop and tell you the secrets of the trade. Now sharing information is the norm and this will help to keep the arts alive for the future. 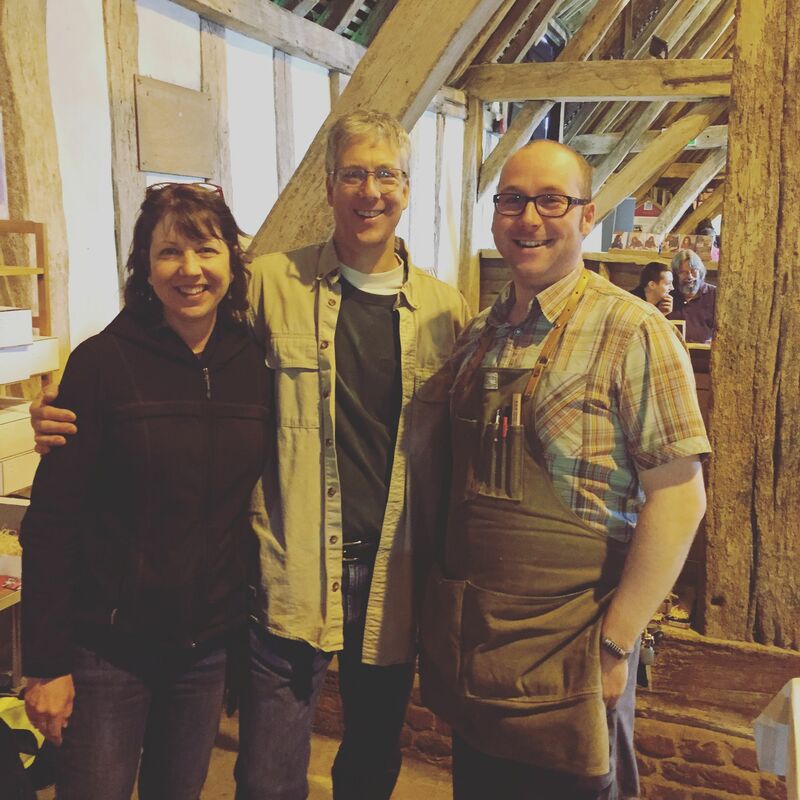 I try to pass on some of the knowledge I have gained over the wears and help new woodworkers out whenever I can, but just like them I am also still learning, especially with my keen interest in traditional hand-tool skills. 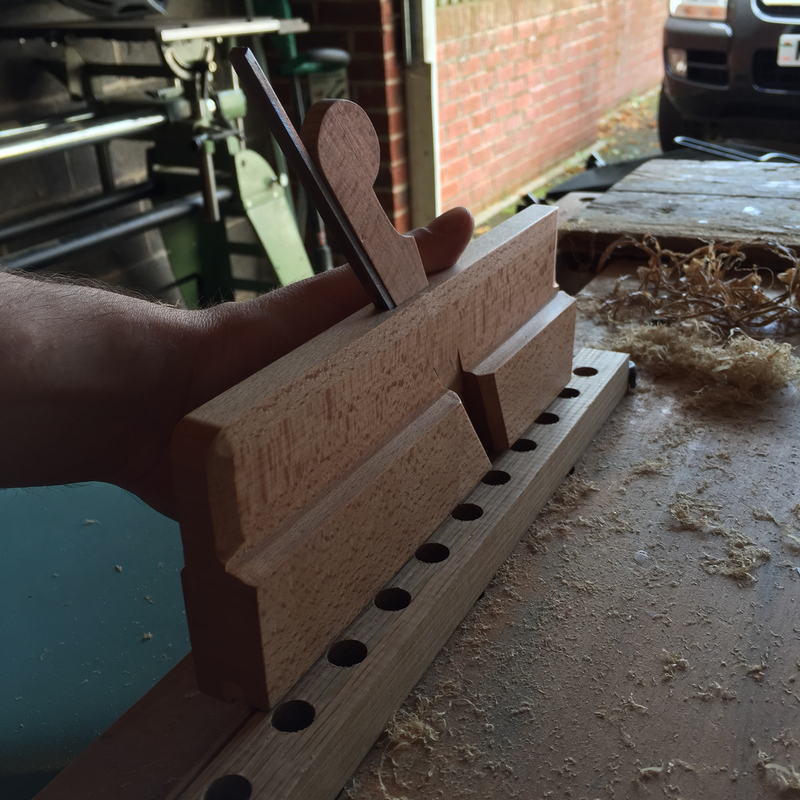 You’ve made dovetail markers, the nut saver, and I’ve also seen some mitre jigs on Instagram. What is the next tool you plan to build? I’ve been working on some shooting boards and the mini-bench, and would really like to make some wooden planes. I have a few new ideas which are still in the early stages of development and need more evolving. All will be disclosed if and when they are a success! Yesterday, inspired by James’ recent baby anarchist’s chest build and the fifth anniversary celebrations of the Anarchist’s Tool Chest on Chris’ blog, I fitted a tool rack to the front of my anarchist’s tool chest. I had intended to include a tool rack as part of the original internal fit out last December, but at the last minute decided to wait until I had lived with the chest for a while to see whether it was necessary. After nearly 9 months of working out of the chest, I have found that the two smallest sliding trays were becoming increasingly cluttered with marking tools, screwdrivers, gravers, and other assorted small tools. So the tool rack started looking like a necessary and worthwhile addition. I still had some 1 inch square oak stock left over from fitting the trays and runners for the chest, and I cut that to length so that it rested on the middle runner at each side of the chest. The 1/2″ holes were drilled on 1 1/8″ centres, which did for the functionality of the tool rack. But as I have to look at the rack every time I open the tool chest, I wanted to pretty it up a little. First I cleaned up the show surfaces of the rack with a cabinet scraper, and then used my 1/8″ beading plane by Philly Planes to add a little visual interest. A coat of soft paste wax was the finishing touch. The tool rack was secured in place using two No.8 brass screws, so that I can easily remove it if necessary in the future. All told, the tool rack took me an hour of time, but has added real functionality to my tool chest. Although most of the holes in the rack are still empty, I have managed to de-clutter the two smaller sliding trays, and have a more ergonomic storage solution for many of the smaller tools I reach for on a frequent basis. Which makes that good value for a piece of scrap and only 60 minutes of my time! There is a trap bloggers sometimes fall into (myself included) where we are so keen to show all the esoteric knowledge we have accumulated, that we neglect to talk about the basic things too. Nothing is so basic (yet vital) as good tool care, and I’ve been meaning for a while to write a brief explanation as to how I approach this topic for a while. 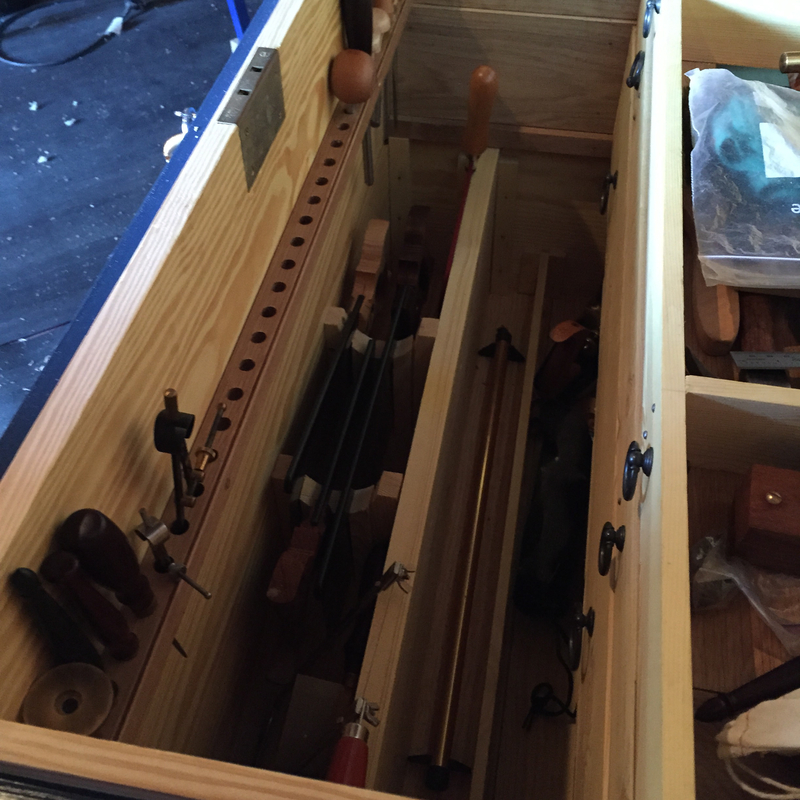 This week has provided the perfect opportunity to write my thoughts on tool care, as I cleaned the tools I took on the Woodworking with Thomas Jefferson course. 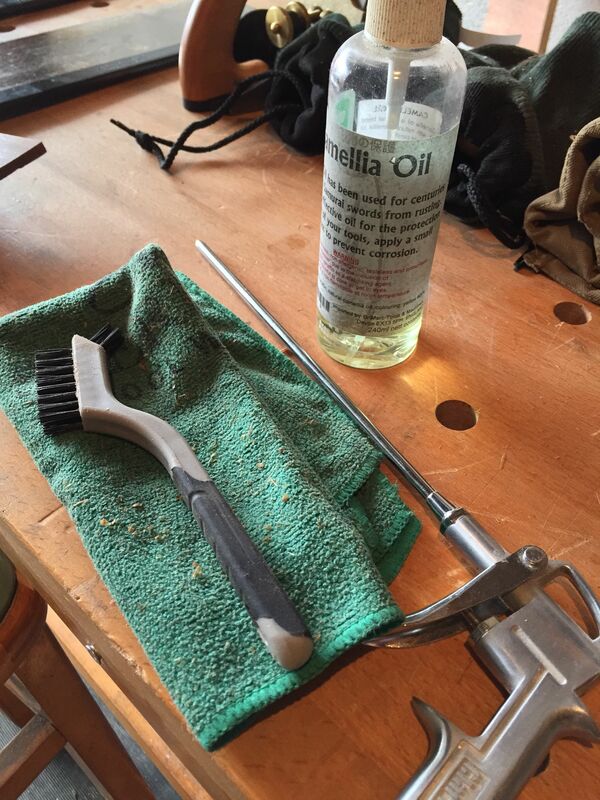 I tend to split tool care into two elements; rust prevention (or tool maintenance), and rust removal. The primary ingredients of rust are dust and moisture, and so rust prevention is necessarily focused on keeping these away from my tools. My Anarchist’s Tool Chest is the first line of defence against rust, as the close fitting lid and dust seal form a very solid barrier. With the GoldenRod fitted I’ve not had any incidence of rust (or even of brass discolouring) for several months. A tool chest alone, no matter how solid, is not sufficient to completely guard against rust and there are a couple of simple steps which can help keep rust at bay. My rust prevention kit is very simple; a nylon bristled brush commonly found at most hardware stores (a tooth brush would work just as well) removes dust and wood shavings without marring the tool, while a spritz of camellia oil wiped on with my Sterling Tool Works microfiber woobie provides a protective coating from moisture. The trick with a woobie is to allow it to become impregnated with your rust barrier of choice, and to avoid washing it unless it becomes contaminated with metal filings or other hard detritus. My current woobie has been in service for a year now, and having been sprayed with camellia oil regularly as well as used to wipe 3-in-1 onto my vice threads or other machinery, has become well impregnated with various rust barrier solutions. The result is a cloth which now only needs the occasional top up spray to keep it imparting essential rust barrier oils to my tools. Simple tools such as marking knives and chisels only require a quick wipe down before they are returned to the tool chest. For planes, or other tools with moving parks, I disassemble the tools (including removing chip breakers from blades), wipe all of the components, and reassemble (being careful not to put the newly cleaned tool back down in any stay pile of shavings). The final tool in my rust prevention kit is a fine tipped air blower, which is run off a compressor at a gentle 15 PSI. The fine nozzle allows me to remove dust from parts of a tool where my fingers or the nylon brush can’t reach. This combination is my first port of call for rust removal. However, sometimes despite your best efforts some rust does appear. 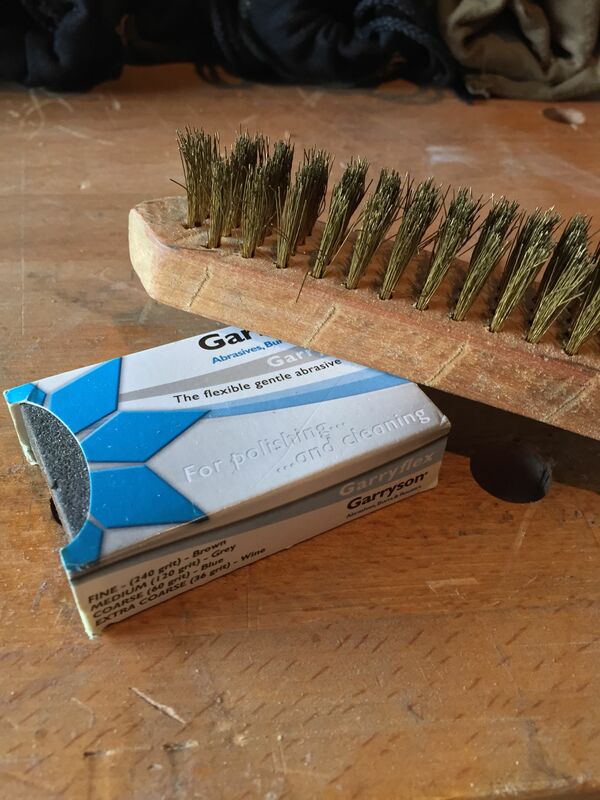 My first choice for rust removal is a Garryflex fine grit abrasive block. This is essentially a rust eraser which removes light rust while leaving the healthy tool metal untouched. For my own tools this is always sufficient thanks to the rust prevention methods discussed above. 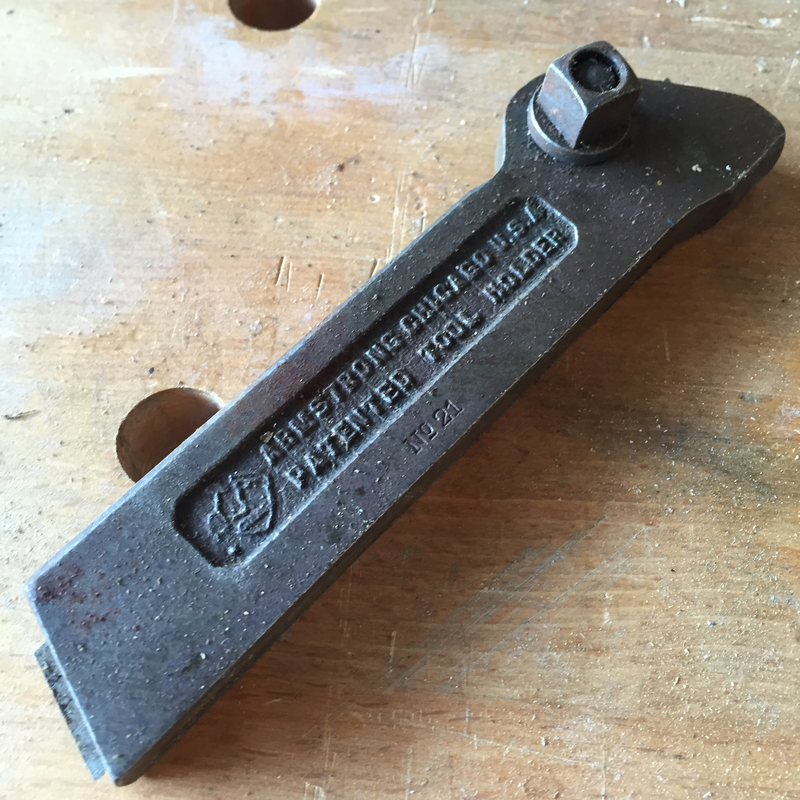 But where I am cleaning up an older tool (for instance some of the tools which previously belonged to my grandfather) with more stubborn rust, a more aggressive approach is needed. For this I use a stiff brass bristled brush which so far as removed all but the very worst patches (and I will write about tool restoration and widespread rust removal separately). Rust prevention, and removal, do not need to be complex processes. In fact, I think that the hallmark of a good rust prevention regime is one which is simple enough to become part of your workshop routine, without the need to dedicate additional time or resources. It was with some horror that I realised only two weeks before my course with Roy Underhill that I’ve barely cut any dovetails this year. 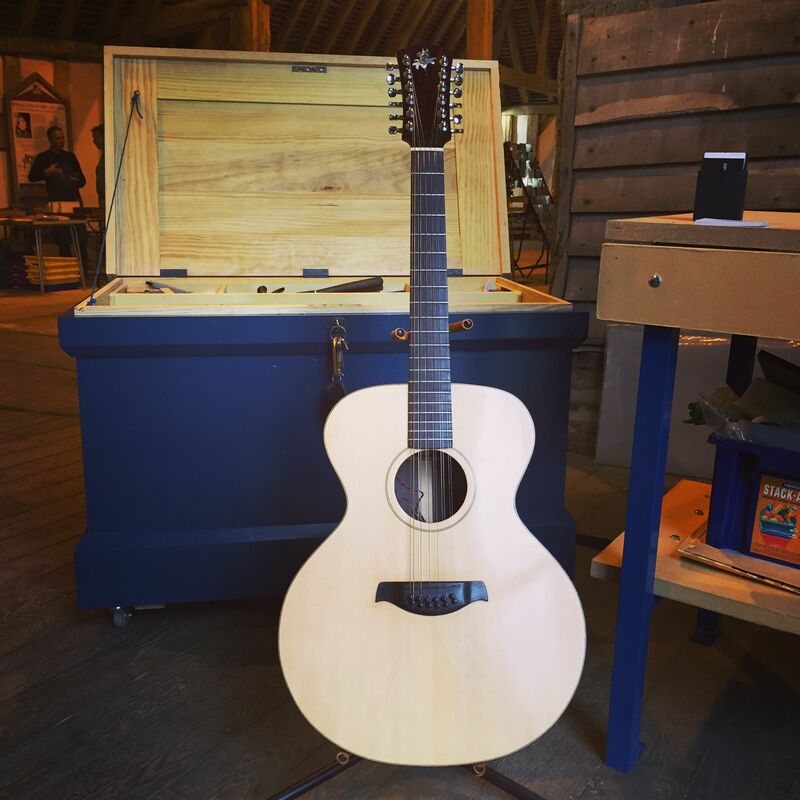 This has mainly been due to losing workshop time because of the move, and then focusing on the parlour guitar and my Furniture & Cabinetmaking articles. But even though I know I can cut a half-decent dovetail (thanks to last year’s dovetail death march with Chris Schwarz) I thought I should get reacquainted with my dovetail saw and put in some practice before the course with Roy. And then I had a slightly better idea. Because you see, it is always worth stripping a technique back to very basics, and revisiting the fundamentals, regardless of your current skill level. This is a training technique I have always found to be very beneficial (and enjoyable) in my martial arts training. Leave the complex techniques alone for a few minutes, take something simple that you know off by heart and break it down to its constituent parts, dissecting exactly what happens at each stage of the technique. 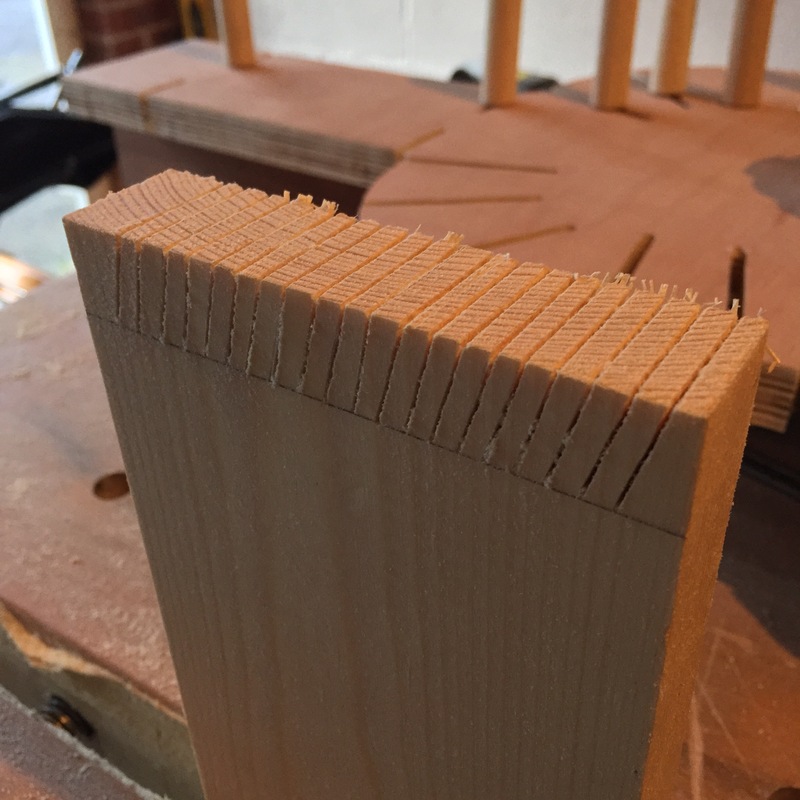 So instead of diving straight in to those practice dovetails, I decided to spend a couple of nights running through the Night of 100 Cuts exercise. Now, I wrote about this exercise back in June last year, but in a nutshell it involves practicing each of the 5 cuts you use in a dovetail (square on and straight down, angled left and straight down, angled right and straight down, square on and angled left down, and square on and angled right down) in isolation. So 20 repetitions of the first cut, followed by 20 of the second cut, and so on. And here is the interesting thing about repeating this exercise for the first time since the Anarchist’s Tool Chest course. When I first started using the exercise last year I thought it was all about training that all important muscle memory of what dead plumb actually felt like, and how that compares to a 1:4 angle slope for cutting tails. And yes, that is an important part of the exercise. But I think it goes beyond that. Much like when I start breaking down my favourite joint manipulations in martial arts training, this week I have found Night of 100 Cuts to be an opportunity to focus on each aspect of each cut. So what are my feet doing? Where is my centre of balance and weight distribution? How am I orientating my upper body and shoulders in relation to my sawing hand? How am I gripping the saw (like I’m cupping a baby bird, as you asked)? What is my left hand doing? All the same questions I would ask when breaking down a wrist lock (apart from the cupping action, we rarely cup in the dojo). And then, how do all of the above change when I move from cutting the left edge of a tail (square across the board, downward slope to the right) compared to cutting the left edge of a pin (angled to the left across the board, straight down)? To what extent does my posture, stance, and movement change between the five cuts? It becomes a forensic examination of the technique from the ground up. Building things is always more fun than practice cuts or practice joints, but practicing a high number of repetitions of each cut, safely away from a real life project, means that you can analyse and adjust each element of your technique, and understand what effect your stance and posture have on a particular cut. Of course the ultimate aim is to not have to think about any of this, just to step up to the board and cut row after row of perfect dovetails right off the saw (what in Jiu Jitsu we refer to as “mushin”; a clarity of mind in which the body can react without higher thought processes interfering). But to get there, the mind has to do a lot of thinking, and the more we progress and understand a technique, the more I think it is possible to get out of a seemingly simple exercise like Night of 100 Cuts. Because as our understanding and skill level increases, we become more sensitive to the nuances of a given technique or operation. Simplicity, it would appear, is onion-like in its layers.